David Zurick earned his PhD in Geography from the University of Hawaii and the East-West Center, Honolulu. 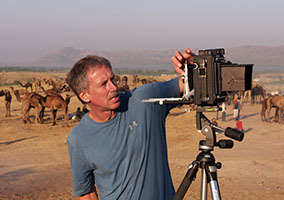 His books and photography have won numerous awards, including the National Outdoor Book Award and Kentucky Arts Council Al Smith Visual Artist Fellowship Award (twice). In 2009 he received the “Mt Everest Award” for his lifetime achievement in Himalaya studies. He is a Fellow of The Explorers Club. In 2006 David produced the acclaimed Illustrated Atlas of the Himalaya. In 2011 his ten-year photographic study of the American South was published in the book Southern Crossings: Where Geography and Photography Meet. And in 2014 he completed a ten-year series of photographs about sacred places in Tibet and the Himalaya, which are published in his book Land of Pure Vision. For several years he lived in Polynesia, where he made images for his project Oceanic Coordinates: Rising seas, losing paradise. In 2014 David began a series of color photographs in India called Painted Towns. David’s documentary film “Crossing Sacred Ground” was completed in 2017 and is making its way through the festival circuit. His new book Morning Coffee at the Goldfish Pond: Seeing a World in the Garden was published in 2017.